Ellis Island Hotel, Casino & Brewery has broken ground on its new two-story bar, dining and entertainment venue, The Front Yard. Scheduled to open in late 2017, the indoor/outdoor attraction will offer a capacity of 300 and feature a casual garden-like atmosphere with wood fixtures, exposed steel and low lighting; games such as corn hole, shuffleboard and beer pong; regular live entertainment by local performers; and second floor atrium with a view of the Las Vegas Strip. An existing exterior wall will be replaced with a window so the Ellis Island on-site brewery, which will celebrate its 20-year anniversary in 2018, will be visible from the space, where patrons can see the copper tanks and the brewing process. Additionally, the place has plans to distill its own spirits, which will be served along with its house-brewed beers. The Front Yard, Ellis Island Hotel, Casino & Brewery, 4178 Koval Lane, Las Vegas, NV 89109, 702-794-0888. The otheroom, the unique bar concept that has been in operation in Venice Beach, Calif., and Manhattan’s West Village for more than 30 years, has opened its first Las Vegas location at Forum Shops at Caesars, situated in front of the Strip-side Trevi Fountain landmark. Décor features a chic, candlelit aesthetic with industrial brick and metal finishes, and the seductive setting blends masculine and feminine touches. Menu highlights exclusive to the Las Vegas outpost include the house special shiitake burger, short rib grilled cheese, maple bacon “tots” and charcuterie plate. To accompany the food, several signature cocktails are offered, such as the “Smokey and The Bandit,” a twist on the popular Mule incorporating Basil Hayden’s Bourbon with smoked peach liqueur, fresh lemon, Angostura and ginger beer served in a chilled copper mug. The otheroom is open daily from 11 a.m. the otheroom, Caesars Palace, Forum Shops at Caesars, 3500 Las Vegas Blvd. S., Las Vegas, NV 89109, 702-836-2096. Located adjacent to the Downtown Container Park, 7th & Carson bar and restaurant is now open for dinner Thursday through Monday featuring a menu of small plates at approachable price points. Guests enter directly into a lush patio garden with fresh herbs hanging from the walls and green foliage lining the brick enclosed outdoor dining area. Guests may eat al fresco under the sparkling lights, in the main dining room or at the counter of the exhibition hearth oven. Designed by executive chef Gregg Fortunato, dishes are highlighted by extra crispy fried chicken wings dusted with a tangy spice blend and sided by house-made honey habanero hot sauce; white truffle toast (wood-fired garlic bread with Gouda fondue); and duckling potpie, a duo of bite-size buttery pastry puffs filled with duck leg and wood-roasted vegetables. 7th & Carson, 616 E. Carson St., Ste. 110, Las Vegas, NV 89101, 702-868-4119. STACK at The Mirage has launched the “LOVE STACK Dining Experience” in partnership with The Beatles LOVE Cirque du Soleil show. Priced at $55, the prix-fixe three-course menu includes a choice of French onion soup, wedge salad or kale salad; eight oz. filet mignon, roasted chicken or wild mushroom risotto; and blueberry filled jelly donuts “Munchkins.” The dining experience is offered exclusively for LOVE ticket buyers, and guests will also receive discounted show tickets. For tickets and more information, e-mail The Mirage Concierge at [email protected] or call 702-792-7777. STACK, The Mirage, 3400 Las Vegas Blvd. S., Las Vegas, NV 89109, 702-792-7800. Lakeside at Wynn Las Vegas has introduced the Lobster Supper, a new seasonal dining experience spotlighting the distinct flavors and preparations of Maine lobster. Available nightly from 5:30 p.m. to 7 p.m. and running through Labor Day, the special menu includes lobster corn chowder; chilled Maine lobster salad; New England lobster roll; Maine lobster bake with steamed lobster, mussels, clams, sweet corn and potatoes; broiled Maine lobster frites; lobster mac and cheese; and surf & turf: chile-rubbed broiled half Maine lobster and charred beef tenderloin skewer. Lakeside, Wynn Las Vegas, 3131 Las Vegas Blvd. S., Las Vegas, NV 89109, 702-248-3463. Morels French Steakhouse & Bistro at The Palazzo is offering a four-course tasting menu featuring the restaurant’s favorites and new summer dishes from executive chef J.L. Carrera. Priced at $45, the menu includes a choice of calamari frito or curry coconut shrimp; steamed PEI mussels, beef tenderloin tartare or Snake River Farms American Kobe sliders; Marchini Farms radicchio salad, snap pea Caesar salad, hearts of romaine salad or Greek salad; and free-range chicken paillard, shrimp pappardelle, grilled petit filet mignon or New York grass-fed sirloin. Guests can add a macaron trio with chocolate sauce and whipped cream for an additional $5 or a wine pairing for $20. The special is available through Labor Day for dinner Monday through Thursday 4 p.m.-11 p.m., Friday and Saturday 4 p.m.-midnight and Sunday 4 p.m.-10 p.m. Morels French Steakhouse & Bistro, The Palazzo Resort Hotel Casino, 3325 Las Vegas Blvd. S., Las Vegas, NV 89109, 702-607-6333. Morimoto Las Vegas at MGM Grand Hotel & Casino is now offering an omakase menu, a selection of dishes put together by chef Morimoto that are unique to his Las Vegas restaurant. The six-course tasting menu is priced at $140 per person (plus tax and tip) and includes cold and hot appetizers, a selection of sushi, a signature entrée and a dessert. A wine or saké pairing is available for an additional $95 per person. Morimoto Las Vegas, MGM Grand Hotel & Casino, 3799 Las Vegas Blvd. S., Las Vegas, NV 89109, 702-891-3001. The Venetian/Palazzo has unveiled The Biergarten at Lagasse's Stadium. Covering 1,800 square feet and located on the patio of the restaurant, the gathering space brings elements of a traditional beer hall with communal bench seating, ambient string lighting and lush greenery. A menu of German-inspired cuisine includes homemade potato pancakes, a giant Bavarian pretzel with beer cheese, flame-grilled bratwurst or knackwurst, and thinly pounded crispy pork or chicken schnitzel. Also offered are bottles, buckets and pitchers of beer, "frozen beer" and specialty cocktails such as the Kickin' Mule with Ketel One Vodka, Monin habanero lime syrup, fresh lime and ginger beer. The Biergarten at Lagasse's Stadium is open seven days a week from 4 p.m.-10 p.m. All guests must be 21 years of age and older. 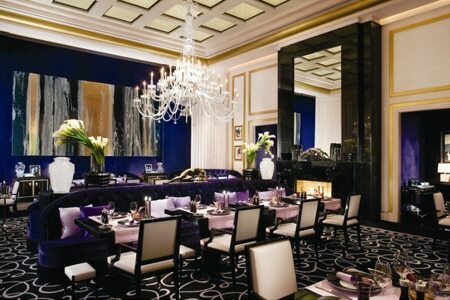 Lagasse's Stadium, The Palazzo Resort Hotel Casino, 3325 Las Vegas Blvd. S., Las Vegas, NV 89109, 702-607-2665. After being closed for a two-month remodel, Jean-Georges Steakhouse at ARIA has reopened. “Milk drops” still hang from the ceiling in the expanded lounge, which has granite high-top tables and black and gold velvet bar stools. The elevated dining room now features a geometric frame made from a brushed dark bronze metal at the entrance. Outlines of cows that ringed the room have been replaced with a lattice pattern on the walls. New to the menu is a tableside carvery from which sliced meats are served with choices of rack of American lamb, bone-in Châteaubriand, smoked Wagyu brisket and Wagyu tomahawk. 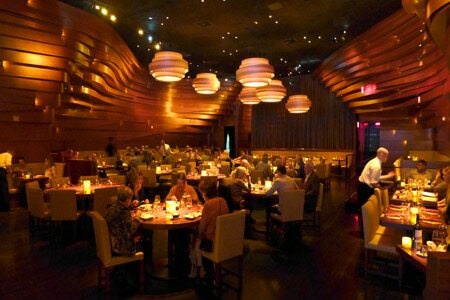 Jean-Georges Steakhouse, Aria Resort & Casino, CityCenter, 3730 Las Vegas Blvd. S., Las Vegas, NV 89109, 877-230-2742. 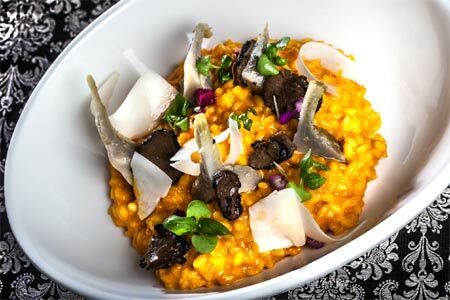 Zuma at The Cosmopolitan of Las Vegas is offering a three-course menu sampling, available throughout the summer. Priced at $60, each meal includes miso soup and a Zuma salad; choice of steamed Japanese spinach with sesame sauce, fried calamari, fried soft shell crab, yellowtail sashimi, chef’s daily maki or chef’s daily sushi; grilled vegetable donburi, sashimi chirashi don, salmon teriyaki, grilled branzino, oven-roasted barley miso chicken or spicy beef tenderloin; and green tea and banana cake with coconut ice cream, chawan mushi with exotic fruits or seasonal fruit selection. Zuma, The Cosmopolitan of Las Vegas, 3708 Las Vegas Blvd. S., Las Vegas, NV 89109, 702-698-2199. Throughout the month of July, Umami Burger, Beer Garden & Sports Book at SLS Las Vegas will support local beer by turning four of its taps over to Lovelady Brewing Company. The four brews include 9th Island, a golden kettle soured ale with pineapple purée; Love Juice, a Northeast-style IPA with a strong aroma of orange and tropical fruit; Café Femenino, a porter made with chocolate malt and Peruvian Café Femenino coffee, roasted at the local Mothership Coffee Company; and Love Triangle, a unique red ale made with a combination of Belgian yeast, German malt and American Citra hops. Beers are priced at $9 for a 14-ounce draft, $15 for a 25-ounce draft and $27 for a 50-ounce souvenir yard. On Tap Takeover Tuesdays, guests may purchase any Tap Takeover 14-ounce draft and receive the second draft for free, limit one per guest. Umami Burger, Beer Garden & Sports Book, SLS Las Vegas, 2535 S. Las Vegas Blvd., Las Vegas, NV 89109, 702-761-7614. Joël Robuchon Restaurant at MGM Grand Hotel & Casino will be closed from July 31-August 13, 2017, for annual restaurant updates. It will reopen on Monday, August 14. Joël Robuchon Restaurant, MGM Grand Hotel & Casino, 3799 Las Vegas Blvd. S., Las Vegas, NV 89109, 702-891-7925. Triple George Grill in downtown Las Vegas will celebrate its 12th anniversary with Cheers to George and 12 Days of 12-Hour Happy Hours promotions. From July 12 through July 30, anyone named George will get a complimentary appetizer with their meal, two Georges dining together will be served a whiskey flight and three Georges will receive a 96 oz. porterhouse steak and house wine free for the table. In addition, during the same time period Triple George’s Happy Hour will run from noon to midnight, with daily specials including discounted drinks, appetizers, prizes and give-a-ways for everyone at the counter bar. Triple George Grill, 201 N. Third St., Las Vegas, NV 89101, 702-384-2761. Shaun King has been appointed executive chef of Momofuku at The Cosmopolitan of Las Vegas. Past positions King has held include chef de cuisine at Rick Moonen’s RM Seafood and executive sous chef of SUSHISAMBA in Las Vegas, chef de cuisine at Bradley Ogden’s Root 246 in Solvang, executive chef at Martis Camp in Lake Tahoe and executive chef of The Dawson in Chicago. 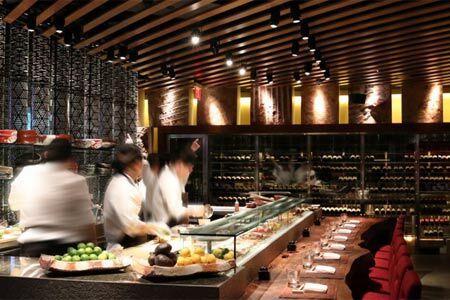 King also oversaw the operations for the back of house at Pabu and The Ramen Bar for the Mina Group in San Francisco. 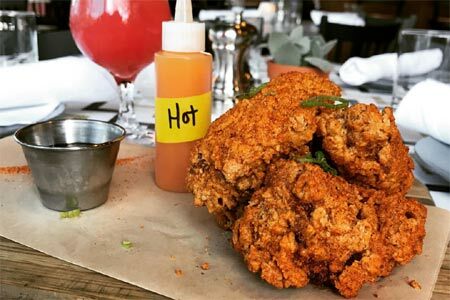 King is working with the Momofuku culinary team to debut a new menu in the coming months. Momofuku, The Cosmopolitan of Las Vegas, 3708 Las Vegas Blvd. S., Las Vegas, NV 89109, 702-698-7000. Standard & Pour, located in Henderson, unexpectedly closed its doors on June 27. The restaurant was a collaboration between the late Kerry Simon’s Simon Hospitality Group and Titan Brands, which runs Hussong’s Cantina and Slice of Vegas, both at Mandalay Place on the Vegas Strip. A statement sent to the media read, “Standard & Pour has closed, effective immediately. The restaurant partners would like to thank their customers for their patronage and look forward to seeing them at one of their other locations throughout the Las Vegas Valley.” The restaurant had been open for just shy of one year and was the last project that Simon worked on prior to his death in 2015. The Simon group’s Carson Kitchen in downtown Las Vegas remains open. Standard & Pour, 11261 S. Eastern Ave., Ste. 200, Henderson, NV 89052, no phone.